A line on Rep. Alexandria Ocasio-Cortez's website supporting "economic security to all those who are unable or unwilling to work" triggered backlash this week and prompted mixed messages from her team about where the line came from. One of Ocasio-Cortez's advisers said on Fox News that the line was from a "doctored" document and that Ocasio-Cortez had never proposed such a policy. But Ocasio-Cortez and her chief of staff later admitted the webpage was authentic, but that it had been a draft published by mistake. Ocasio-Cortez added there were also doctored versions circulating online. A line on Rep. Alexandria Ocasio-Cortez's website supporting "economic security to all those who are unable or unwilling to work" triggered backlash this week and prompted mixed messages from her team about where the line came from, and whether it was ever intended to be part of the landmark Green New Deal policy package. 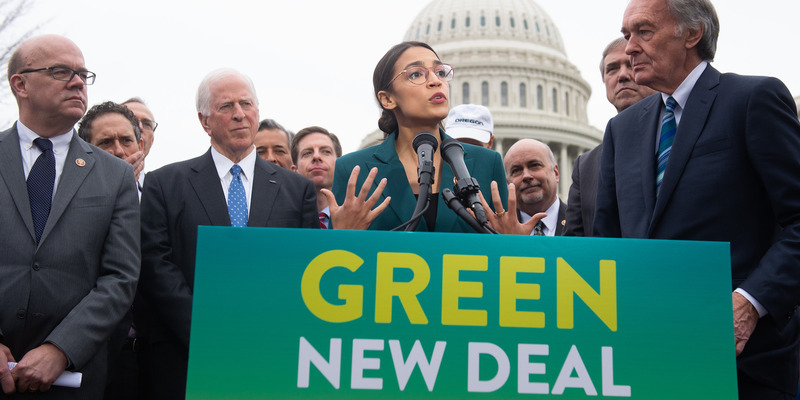 The controversy has given fodder to critics of the Green New Deal legislation, which was unveiled Thursday. 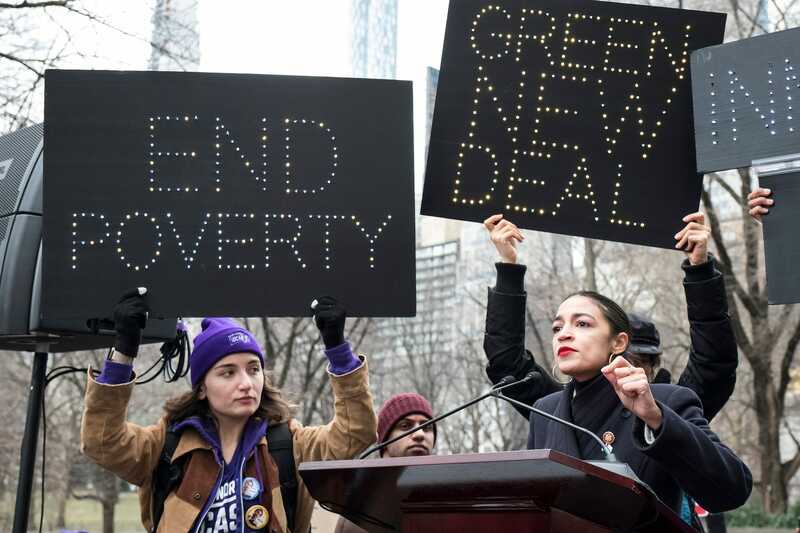 Though the actual Green New Deal legislation introduced to the House of Representatives contains no mention of guaranteeing economic security to those "unwilling to work," the phrase was included on Ocasio-Cortez's website in a Frequently Asked Questions page that has since been removed from the site. The page was also sent to reporters, including NPR, which published the document, and the Washington Post. Intense criticism ensued, and some of Ocasio-Cortez's staffers and advisers attempted to walk back the "unwilling to work" line. First, one of her surrogates said the document was "doctored" and circulated by Republicans, then her chief of staff said the line was from a draft that was never intended for publication. In a tweet on Saturday evening, Ocasio-Cortez's chief of staff, Saikat Chakrabarti, explained that the line was written with specific recipients in mind, such as retirees. Robert Hockett, a Cornell University law professor and adviser to Ocasio-Cortez, was asked by Fox News' Tucker Carlson why Americans should pay those who are unwilling to work. "We never would, right? And AOC has never said anything like that" Hockett answered. "I think you're referring to some sort of document — I think some sort of doctored document that somebody other than us has been circulating." He continued: "It seems that apparently some Republicans have put it out there." Though Carlson appeared to accept the answer, Ocasio-Cortez's website did indeed contain the line, as an archived version of the webpage shows. A Media Matters for America researcher, Andrew Lawrence, tweeted out the clip and praised Hockett for debunking "conservative media lies." However, the "unwilling to work" line was indeed on Ocasio-Cortez's website for a time and was not the product of conservative media. Ocasio-Cortez retweeted Lawrence's post, and it remained on her timeline as of Saturday night. Hockett on Saturday rejected the idea that he was mistaken during his interview with Carlson, and attempted to put the attention back to the text of the bill formally submitted to Congress. "I have said that we appear to have been referring to different documents, as it turns out there were multiple documents being discussed yesterday with no one person having a handle on them all," he tweeted. "Might we now discuss the Resolution?" Ocasio-Cortez and Chakrabarti, also took to Twitter on Saturday afternoon to address the controversy, arguing that people should focus on the legislation, and not the since-deleted webpage. Both argued that there was indeed at least one doctored version of the FAQ, but that the authentic page on Ocasio-Cortez's website was published "by mistake" after a lengthy brainstorming and drafting process. "We did this in collaboration with a bunch of groups and offices over the course of the last month. As a part of that process, there were multiple iterations, brainstorming docs, FAQs, etc. that we shared. Some of these early drafts got leaked," Chakrabarti tweeted. He continued: "There separately IS a doctored FAQ floating around. And an early draft of a FAQ that was clearly unfinished and that doesn't represent the GND resolution got published to the website by mistake (idea was to wait for launch, monitor q's, and rewrite that FAQ before publishing)." He finished by noting that "mistakes happen," and that the text of the legislation accurately represents the Green New Deal. Ocasio-Cortez, too, tweeted that there were "multiple doctored GND resolutions and FAQs floating around," as well as "a draft version that got uploaded + taken down." "Point is, the real one is our submitted resolution, H.Res. 109," she said, adding, "When I talk about the GND, this is what I'm referring to - nothing else."